After watching Angelique Kerber win at Wimbledon I fancy something a bit fruity. It's certainly hot enough outside for a refreshing pale ale with added tropical fruits. 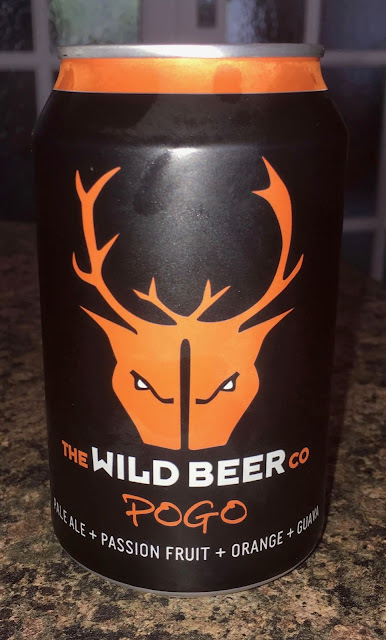 This Pogo pale ale from the Wild Beer Company had passion fruit, guava and orange added in the brewing. At 4.1% volume this pale ale was inspired by a fruit drink the brewer used to have when they were a child growing up in Hawaii. That tropical mixture has been added to this pale ale in order to produce a thirst-quenching hoppy beer. Just what I need on this hot afternoon.